Aarav Collection also manufactures and supplies Chanderi Hand Block Printed Sarees. 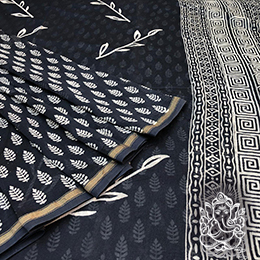 If you are searching for something conventional that gets the eyes of everybody, you can,t turn your back on our manufactured unique collection of Chanderi hand block print sarees. 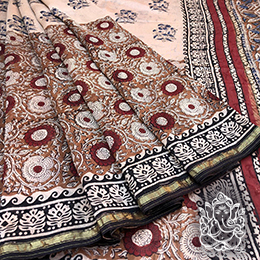 The saree shopping is so much fun, come and experience it with Aarav Collection - Exporters of Ethnic Wear Handblock Print. 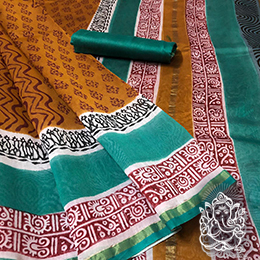 The sarees are fundamentally handwoven, and different patterns with the assistance of block printing are doled out to these sarees. The charming outlines emphasize the presence of these sarees. The straightforward handloom cotton sarees are changed to look fabulous. Our master creators monitor the most recent form patterns and continue testing to deliver something remarkable. 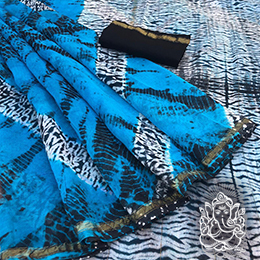 Our Manufacturer collection even comprises of sarees where more consideration is engaged in styling the pallu, embellishing the look of a saree. 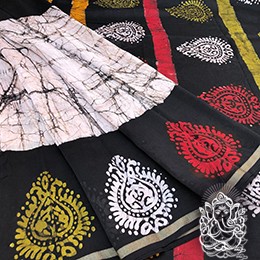 Some of these handblock printed sarees are decorated with stones and kundans, making it an awesome wear at gatherings and wedding occasions. The straightforward Chanderi Hand Block Printed Sarees are reasonable for corporate purposes too. 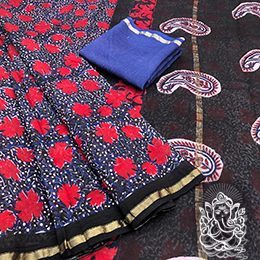 Block prints are accessible in cottons, crepes, chiffons, chanderis, silks and nets. 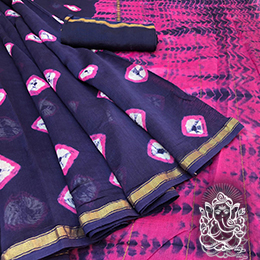 Our handpicked Manufacturer collection of Indian Hand Block Printed Chanderi Silk Saree including absolutely captivating patterns and themes matched with striking weavings, for example, Resham, zari, stones, and string work. 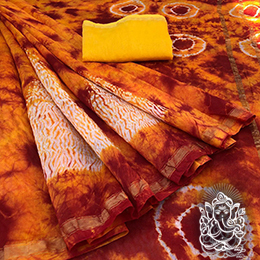 You can purchase block printed chanderi silk sarees from our web based shopping stores. The rich collection at our online stores will influence you to experience passionate feelings for the brand. What,s more, you generally have an alternative of picking a reasonable square print sari for various events. Easygoing, Festive and Wedding are the key choices with a tremendous scope of sarees. We,ve insightfully made these with regards to the event. For easygoing circumstances, we,ve an impressive collection of chanderi silk block print saree with moderate of weaving. They look staggering and cast an everlasting spell. Wear them on wedding or occasions whenever you like! We have lots of exclusive collection of chanderi sarees which you can buy at wholesale price because we are wholesalers and suppliers too. For bulk orders or enquiries contact us or ping on whatsapp.